Warnings to avoid "bloody Kansas" prompted the Steinauer brothers, Anton, Nicholas, and Joseph, to settle here in Pawnee County. They arrived in September 1856, only two years after the creation of Nebraska Territory. Famine and depression had forced them to leave their native Switzerland in 1852. Although the brothers were among the first to claim land in this area, other immigrants of Swiss, German, Austrian and Bohemian descent soon settled nearby. Nebraska City became their chief social and trading center. Indians, including the Oto, hunted and trapped in the region. Turkey Creek and Linden were early popular designations for the site which became Steinauer post office in 1874. After the Chicago, Rock Island, and Pacific Railway reached Steinauer in 1887, the village grew steadily and incorporation followed in March 1893. With railroad development, St. Joseph, Missouri became the chief urban market for the agricultural products of Steinauer and the surrounding area. By 1910, the village's peak population of 248 had been achieved. Over the years, the pronunciation of the name evolved to "Steener" though the original spelling has been retained. Today, Steinauer is a quiet community which remains rooted in the history and traditions of its pioneer settlers. 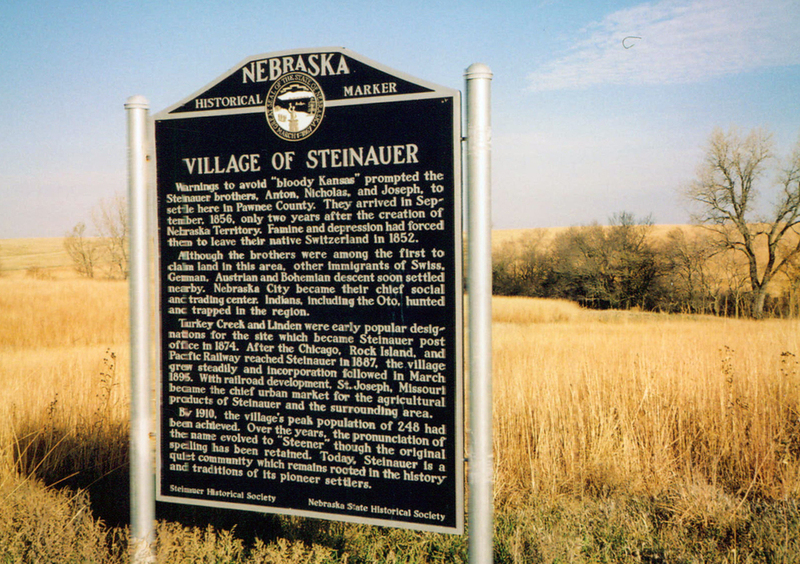 “Village of Steinauer,” Explore Nebraska History, accessed April 19, 2019, https://mynehistory.com/items/show/394.